Passover means a hankering for floury, baked goodness. 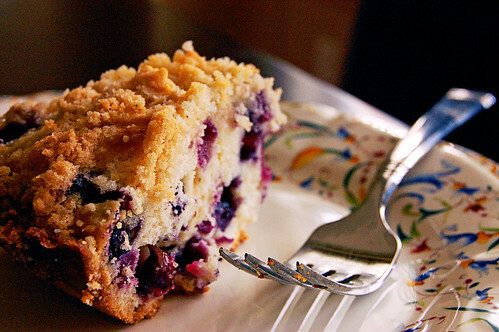 With blueberry season around the corner I’m looking forward to making one of my favourite recipes – blueberry buckle. I don’t have a huge sweet-tooth, so this recipe by Alton Brown hits the mark. 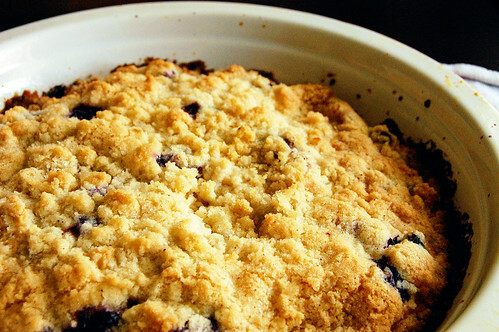 A traditional cobbler has fruit on the bottom, topped by dough. Whereas a buckle has the fruit mixed in. 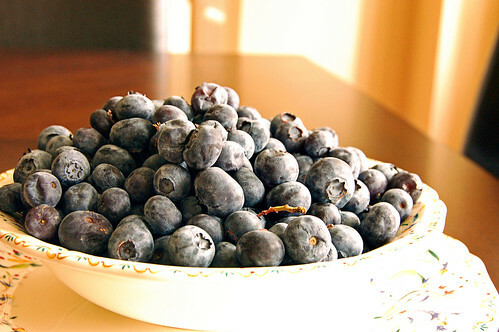 Absolutely perfect with a cup of coffee, this buckle balances between sweet and salty, allowing the blueberries to really steal the show. In a medium mixing bowl whisk together the flour, baking powder, and salt. Set aside. In the bowl of a stand mixer, with the paddle attachment, beat together the butter and sugar on medium speed until light and fluffy, approximately 1 minute. Add the egg and beat until well incorporated, approximately 30 seconds. Add 1/3 of the flour mixture and beat on low speed just until incorporated and then add 1/3 of the milk and beat until incorporated. Repeat, alternating flour and milk until everything has combined. In a small bowl combine the sugar, flour and nutmeg. Add the butter and work into the dry ingredients using a fork to combine. Continue until the mixture has a crumb-like texture. Sprinkle the mixture on top of the cake. Bake on the middle rack of the oven for 35 minutes or until golden in color. Cool for at least 10 minutes before serving.